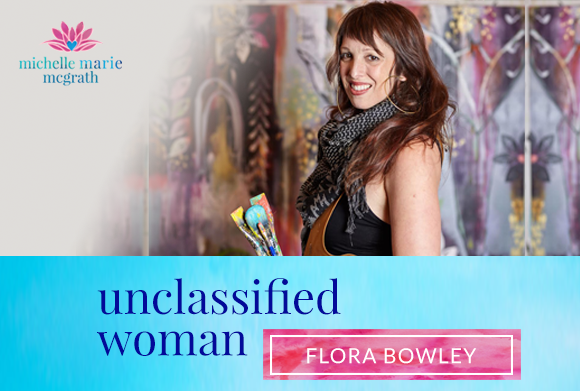 My guest today on Unclassified Woman is the inspiring Flora Bowley, a painter, creative pioneer, gentle guide, and author of two books: Brave Intuitive Painting and Creative Revolution. Flora blends over 20 years’ experience as a yoga teacher instructor, healer, and lifelong seeker. She passionately believes creative expression is waiting to unfold within every person who is brave enough to trust, let go, play, and explore. How good does that sound? Flora’s soulful approach to the creative process has sparked a new holistic movement in the intuitive art world, empowering thousands of people to courageously pick up a paintbrush. She encourages this creative expression through her intimate, in-person workshops, books, and online courses. Flora lives with her partner, Jonathan, his son, and their dog, Pearl, in Portland. Her own vibrant collection of paintings can be found in galleries, shops, and printed on unique products around the world. I’m also delighted to share that Flora has VERY generously offered listeners an amazing discount on her upcoming Creative Revolution e-course happening on 2nd October, so listen in and you can apply the coupon code on her website here. Join me for this amazing conversation with Flora! Flora’s unconventional, winding path in life. Everything Flora has created in following her dreams and implementing her “out of the box” belief system. “A blessing in disguise”- NOT getting into the art schools she thought she wanted. Positive results that come from “just creating”. The wounding from people telling us we “aren’t good enough”. Healing, empowering, and practicing ways of being through creativity. Your soul’s calling and your creative offerings to the world. “Intuitive wandering” exercise and how to implement it. Dropping into your intuition and finding wisdom there. The flow that happens when you engage in the creative process. Simple, accessible exercises to get your creative flow going. Staying present and being open to focus on what IS working. Teaching a workshop including “all the beautiful parts of myself”. Moving forward for Flora: collaboration with others and co-mingling their creations through workshops. Find Flora’s courses, workshops, videos, and products here. Use the coupon code Flora shares towards the end of the episode to receive 30% off her Creative Revolution course! See Flora’s books here (free worldwide postage) Creative Revolution and Brave Intuitive Painting. I do hope you enjoyed this episode and invite you to share with a friend. I would love to hear below your favourite snippet from this interview? I would be so grateful if you would leave a rating or review on Itunes. Thank you!